I think I could pretty much just stop writing this blog now because the title just says it all. This is the most DANGEROUS recipe I have ever made so I’m giving you fair warning. If you’re addicted to French Fries you should stop reading now and go do something else. I’ve always tried to steer clear of making french fries at home because I knew if it was too easy I’d probably never make anything else. Or ever leave my house again for that matter. Then I made french fries at home and it WAS too easy. Then, I made a French Fry Salad, and it was delicious and I felt no guilt. 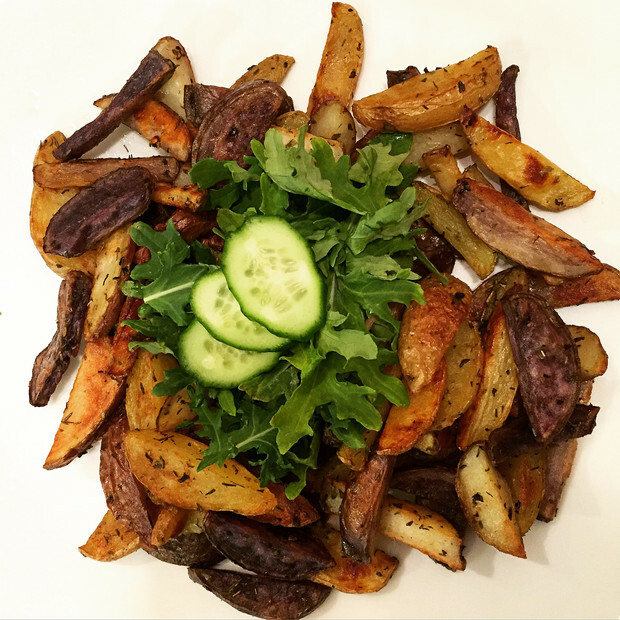 And now my life has changed forever and I can never UN-make this French Fry Salad. 1. Slice your potatoes in french fry shape pieces. 2. Throw them in a bowl. Add all your seasonings. I used every dry herb I had. Oregano, Thyme, Dill, & Basil. Add Salt & Pepper. Mix well. Then add your oil. 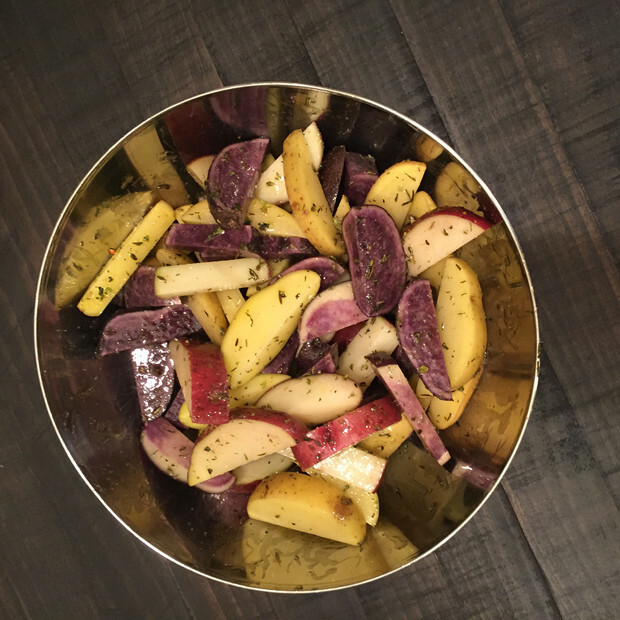 If you add your oil first the seasonings might not stick to your potatoes and you dont want that. Add your oil last. Mix well and get everything coated. 4. Line your baking sheet with parchment paper. This stuff is magic. Your potatoes wont stick which means you can use less oil. That’s why we’ve only used 2 tablespoons in this recipe and that’s actually more generous than you need to be. 5. 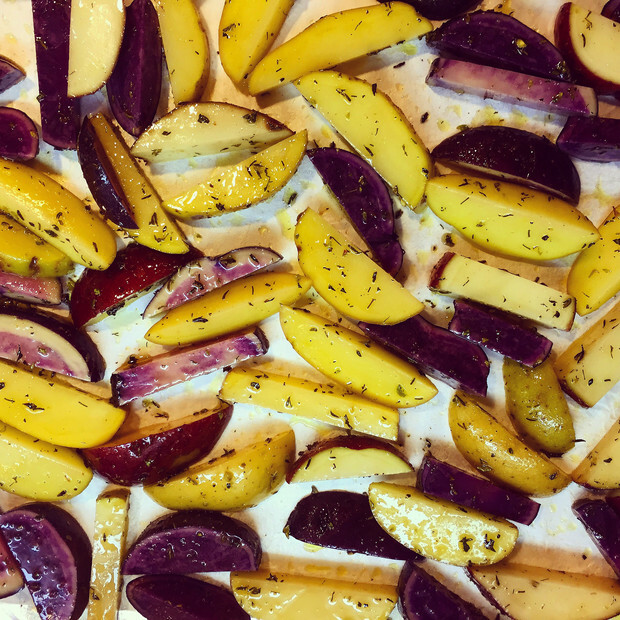 Spread your marinated potatoes evenly on the baking sheet. 6. Bake for a total of 30 – 35 minutes. I took them out every 10 minutes and gave them a flip around to make sure they were crispy on all sides. 7. To plate just cover them in baby kale & cucumbers. I squeezed fresh lemon juice all over and it was PERFECTION. We’re in trouble you guys!!! Call the Vegambulance!! !